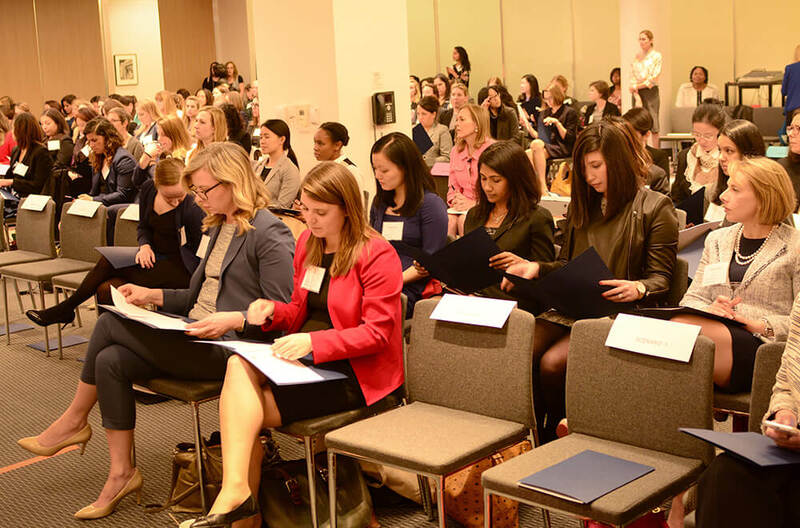 ChIPs launched the inaugural Next Gen Summit to respond to the needs of lawyers in their first 15 years of practice who were looking for a program tailored to the next generation of women leaders. The Mock Exercise hosted at WilmerHale drew 20 firms and consisted of a mini-patent damages trial with members of the judiciary and government agencies presiding over two teams that faced off in front of live expert witnesses and a mock jury. The inaugural afternoon program hosted at Sidley Austin LLP featured an interview with a member of the U.S. Court of Appeals for the Federal Circuit; a panel presentation on different career paths within law; and an interactive workshop focused on building your professional development skills. Lawyers have traditionally faced a solid but limited menu of options, especially at the start of their careers. Then again, the world is changing—and well-behaved women rarely make history. Accomplished women with a variety of perspectives share their history, experience, and advice for people looking for success off the beaten path. Moderator: Emily Hostage, Director of Corporate Development & Policy Counsel, RPX Corp.
Judge O’Malley, Circuit Judge, U.S. Court of Appeals for the Federal Circuit, and her daughter Nora O’Malley, entrepreneur, share their experiences as professional women in a one-on-one interview. Panelists use their personal experience and professional strengths to offer tips and advice on making the digital age—from innovative blogging to inclusion technology—work for you. Moderator: Sarita Venkat, Senior Counsel, Apple Inc.
Joanna Bloor, is a people accelerator, scalability junkie and belief agent for brave and curious women. A veteran in the media space, Joanna has almost 20 years experience in digital media, broadcast television and radio. Working in leadership roles at OpenTable, CBS Interactive and Pandora, Joanna is an established expert in strategy, sales, team development, and ad operations. Joanna is a speaker and panel moderator at industry events including Watermark, Dreamforce and many others. In addition, she has delivered motivational speeches, created customized sales training, team building and personal career development programs for a host of business and organizations including Microsoft, E&Y, and America Online. Joanna is a member of Hipower, a group of women corporate leaders focused on accelerating member’s leadership roles from professional success to wide-ranging significance. Hipower is organized under Leading Women in Technology, an organization dedicated to unleashing the potential of professionals who advise technology businesses and executives. Julie Brush is the premier legal search and industry expert to corporate and law firm executives throughout the globe. Her expertise includes General Counsel, in house counsel (all practice areas/levels) and retained law firm searches. Julie’s awards include The Women’s Initiative Organization Entrepreneur of the Year, Silicon Valley Business Journal’s Women of Influence, The Best and Brightest Business Leaders of “40 Under 40” and the YWCA Tribute to Women & Industry Award. Julie earned her BA from UCLA where she was a member of the Women’s Varsity Tennis Team and professional tennis tour. She received her JD from GGU School of Law and served as a Law Review Member and Editor; and worked full-time while attending law school in the evening. Julie practiced real estate law with Brobeck, Phleger & Harrison and served in a corporate role at Levi Strauss & Co. before founding Solutus. Julie is on the Board of Advisors for Watermark and is the Co-Chair of the General Counsel Network. She serves on the Board of Advisors for Acritas and was an Advisory Board member of the Women’s Intellectual Property Lawyers Association. She is the author of the immensely popular legal blog The Lawyer Whisperer. Eileen Carey is the Founder & CEO of Glassbreakers, a diversity and inclusion enterprise software company. Glassbreakers offers Fortune 1000 companies retention focused technology to make employee resource group management simple, scalable and measurable. Eileen has spent the majority of her career pre -startup in corporate communications and global public affairs. She was previously at Citigroup and Thomson Reuters within their IP enterprise software division called MarkMonitor. She holds an MBA in International Marketing from Fordham and a BA in English from The University of Maryland. Emily Hostage is Director of Corporate Development and Policy Counsel at RPX Corporation. At RPX, Ms. Hostage analyzes and reports on patent market data, and uses them to inform RPX’s corporate strategy. She develops policy strategy and trains internal teams on changes in patent law. Before RPX, Ms. Hostage was an associate at Arnold & Porter LLP where she focused on patents, copyrights, and trade secrets. She also previously served as corporate counsel for a late-stage startup solar technology company. Ms. Hostage received her BS and MS in Electrical Engineering from Boston University, and her JD from Harvard Law School. Lieutenant Commander Temperance C. Huffstetler is an attorney in the United States Navy Judge Advocate General’s Corps. She currently serves as the Victims’ Legal Counsel for Naval District Washington. LCDR Huffstetler attended Duke University on a Naval Reserve Officer Training Corps Scholarship and commissioned as a naval officer in May 2002. She served as a Surface Warrior Officer in a variety of operational roles until 2007, when she entered law school at the University of Florida through the Navy’s Law Education Program. LCDR Huffstetler graduated from the University of Florida’s Levin College of Law in May 2010 and then completed Naval Justice School in Newport, RI. In her first tour as a Judge Advocate, LCDR Huffstetler served at the Washington Navy Yard in Washington, D.C. and the U.S. Naval Academy in Annapolis, Maryland, where she practiced as a criminal defense litigator, legal assistance attorney, and military disability attorney. She was then assigned as Command Judge Advocate for Naval Station Guantanamo Bay in Cuba. From 2014 to 2016, LCDR Huffstetler served as the Command Judge Advocate aboard three nuclear aircraft carriers, providing legal advice regarding military justice, operational law, fiscal law, international law, the law of the sea, and administrative law. Appointed on April 4, 1998, Judge Laporte presides over numerous civil and criminal cases. She also conducts settlement conferences and resolves discovery disputes. Judge Laporte has served on various committees and boards, including the Board of Governors for the Northern California Chapter of the Association of Business Trial Lawyers, the editorial board of the Federal Courts Law Review, the Executive Board of the Ninth Circuit Magistrate Judges, and the Jury Trial Improvement Committee of the Ninth Circuit Court of Appeals. She regularly speaks and participates in panels concerning patent litigation, jury trials, e-discovery, employment law, settlement, and other topics. Judge Laporte is a graduate of Princeton University and Yale Law School and is a Marshall Scholar, with an M.A. from Oxford University. She previously served as a partner at a litigation firm and an Administrative Law Judge. She was also Chief of Special Litigation for the San Francisco City Attorney’s Office, a law clerk to the Honorable Marilyn Hall Patel, and a policy planner/economist at the Federal Trade Commission. Specializing in intellectual property litigation. She has represented both plaintiffs and defendants in complex multi-defendant, multi-patent cases. Her record includes victories at all stages of litigation, including appeal, trial, summary judgment, and motions to dismiss. She has also obtained walk aways for defendants with no payment to plaintiffs, as well as attorneys’ fees and costs awards. She holds a bachelor’s degree in computer science from UC Berkeley, and has litigated cases across different industries, including semiconductors, telecommunications, web technologies, user interfaces, file and storage systems, and medical devices. Nora is currently the Co-Owner and Beverage Director at Lois, an all-tap wine bar in New York’s Alphabet City. She earned her Sommelier certification from the Sommelier Society of America and has worked in various areas of the wine industry since graduating from Georgetown University in Washington, DC with a degree in English. She worked as a PR coordinator for wine clients such as Frescobaldi, Arnaldo Caprai, and Wines of Portugal, before becoming an apprentice at Brooklyn Winery and Manager and Wine Buyer at Alphabet City Wine Company, a specialty wine store in the East Village. Prior to entering the wine industry, Nora earned a graduate certificate in publishing from Columbia University and worked in the food and beverage publishing arm of Crown, an imprint of Penguin Random House. She was also the Director of PR and Social Media at CLEAR, a biometric security company. Tricia Timm is the Founder of GCAssist, a provider of outsourced legal services for high-tech companies. With client demands on the rise, many companies are looking for alternative providers of legal services. Through GCAssist, Tricia is able to provide immediate support to her clients, while at the same time providing alternative legal careers for a new generation of attorneys. Prior to GCAssist, Tricia was the SVP, General Counsel at SugarCRM Inc., a late stage SaaS company. Before that, she held a variety of different in-house counsel roles such as Acting General Counsel for software maker Borland, a public company with over 35 subsidiaries worldwide; Director, Legal at Homestead.com, an Internet start-up, building processes from the ground-up; and she was Corporate Counsel at Vantive Corporation. She gained her practical knowledge of how the law and technology intersect as an associate at the law firm Brobeck, Phleger and Harrison LLP, where she specialized in IPOs, venture financings, M&A and public company representation. Tricia’s awards include The Recorder’s Employer Choice – Legal Department of the Year Award and Silicon Valley Business Journal Diversity Champion- Corporate Counsel Award. Tricia is also on the Advisory Board of the Katherine & George Alexander Community Law Center at Santa Clara University. Sarita Venkat | Senior Counsel at Apple Inc.
Sarita Venkat is Senior Counsel at Apple Inc., where she manages complex, high-risk patent and commercial litigations worldwide. She has secured multiple trial wins, and managed numerous cases to favorable resolutions in the U.S. and abroad on behalf of Apple. Prior to joining Apple, she handled pharmaceutical and medical device litigation worldwide at Abbott Laboratories Inc. including Hatch Waxman cases in the U.S., and defending the company’s IP in Europe, Asia, South America and Russia. She is a registered patent attorney, has a B.S. in Biology and a minor in Psychology. Annsley is an experienced and commercially-focused intellectual property litigator specialising in complex cross-border patent and trade secrets litigation in the life sciences and TMT sectors. With a background in chemical engineering, Annsley advises leading innovative companies on high value patent and SPC litigation before the English courts and CJEU. She frequently supports pharmaceutical clients in coordinating their global litigation strategy and life cycle management projects against generics. Annsley has also advised TMT companies on soft IP issues relating to keyword advertising and cloud computing. Annsley is listed as an IP Rising Star by Super Lawyers (2014, 2015) and, in 2014, was shortlisted in the same category for Euromoney’s Europe Women in Business Law Awards. As a permanent member of the award-winning IPKat blog team, Annsley frequently publishes articles on European and US IP court decisions and developing legislation. Annsley is a recognized expert on the Unified Patent Court advising clients and industry associations on strategic preparations. In 2014, she was appointed as Secretary of AIPPI’s Standing Committee on the UPC and Unitary Patent and is a member of EPLAW.